THE BLEACHER BRIEFINGS: Ever Tried. Ever Failed. No Matter. Try Again. Fail Again. Fail Better. Several months ago I promised there would be a lengthy hiatus from tennis and golf related articles. I kept my promise, but the break now comes to an end. After an unprecedented run by tennis' "Big Four," an unusual suspect won the first of the year's four majors. Roger Federer, Rafael Nadal, Andy Murray and Novak Djokovic have had a monopoly of sorts lately, capturing 34 of the last 35 majors. The lone blemish on that amazing run was when Argentina's Juan Martin del Potro secured the U.S. Open title back in 2009. Add a new blemish. 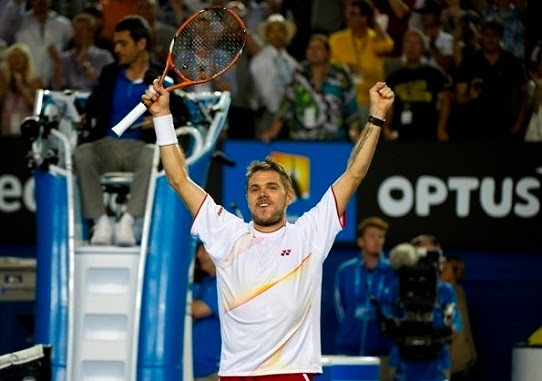 Stanislas Wawrinka defeated the legendary Rafael Nadal on Sunday morning in four sets (6-3, 6-2, 3-6, 6-3) to win the Australian Open and capture his first career major. Not that Wawrinka is a new face on the tour. Quite the contrary, in fact. At 28-years-old, Wawrinka is closer to a senior citizen in tennis years than he is to being a rookie. Almost 12 years into his career (9 on the ATP World Tour), the Swiss player had only managed five wins, none of which were majors, until last weekend. After what likely felt like one too many losses, Wawrinka had the words of Irish poet Samuel Beckett etched on his arm. "Ever tried. Ever failed. No matter. Try again. Fail again. Fail better." When asked about the meaning, Wawrinka replied, "This was my philosophy, my life philosophy, which is a tennis player's philosophy. If you're not Nadal, Federer or Djokovic, you're going to win, but you have to learn from the losses." The inscribing's altruistic meaning will ring louder than ever now. After coming up empty in 35 career Grand Slam Tournaments, it's safe to say Wawrinka was feeling a little disheartened when he had the words inked on his left forearm. With the win, Wawrinka moved up to No. 3 in the world rankings, the first time he has cracked the top 5. He also became only the second Swiss player to win a Grand Slam tourney, and for the first time in an otherwise lackluster career, he passed Roger Federer as the No. 1 Swiss player on the planet. Add to the mix the fact that Wawrinka became the first player to beat the top two seeds at a major (Nadal and Djokovic) since Sergi Bruguera managed the feat at the 1993 French Open. During his final press conference, Wawrinka proclaimed, "There's a good chance I get drunk tonight." If he did, he definitely earned it. Rafael Nadal was spectacular in the semi-finals, beating long-time foe Roger Federer in straight sets. Nadal played brilliantly to Federer's backhand the entire match, in what was one of the best showings of his career. Nadal has had Federer's number since joining the tour, winning 23 of 33 career head-to-head matchups. However, in Nadal's quest to be the best player of this generation, he was unable to capture his 14th career major. Federer holds the record with 17, and a win by Nadal would have certainly closed the gap. Regardless of whom you rank above the other, there is no doubt that these are two of the greatest players ever. When it came time for the finale, it seemed to be a foregone conclusion that Rafa would run away with it, but Wawrinka was simply the better man. Nadal battled with back pain throughout the second set, and it reflected in his play. However, a couple painkillers later, he seemed better and came back swinging hard. Nadal took the fourth and it looked like a comeback was imminent. Alas, Wawrinka buckled down and closed out the match in top form. Nonetheless, Rafa was humble in defeat, as he refused to cite his back as the reason he lost. When asked about his back trouble, Nadal said, "This isn't the time to talk about that. This is a time to congratulate Stan. He played unbelievably. He really deserved to win the title." A classy player in a classy sport. I'll end with this; with Federer clearly coming to the finish of his storied career, and Nadal seemingly slowed by injuries for half of every season, is the end of the Big Four's dominance in the sport almost here?